FC United is a women's football club from Jakobstad, Finland, playing in the Finnish women's fourth tier Naisten Kolmonen. FC United was originally known as the women's section of FF Jaro and the current club was established in 1993. Jakobstad is a town and municipality in Ostrobothnia, Finland. The town has a population of 19,287 and covers a land area of 88.31 square kilometres (34.10 sq mi). The population density is 218.4 inhabitants per square kilometre (566/sq mi). Neighbour municipalities are Larsmo, Pedersöre, and Nykarleby. Naisten Liiga is the premier division of women's football in Finland. It was established in 2006 as the successor of 1971 founded Naisten SM-sarja. The first Naisten Liiga season was played in 2007. The Finnish Women's Cup is the national women's football cup competition in Finland and was first played in 1981. Emmi Alanen is a Finnish football midfielder and former wrestler who plays for Swedish Damallsvenskan club Växjö DFF. Before moving to Sweden in 2013, she played for Kokkola F10, Sport-39 Vaasa, FC United Pietarsaari and HJK Helsinki of the Naistenliiga. Rita Chikwelu is a Nigerian professional football player who plays for Swedish Damallsvenskan club Kristianstads DFF. She previously played for Umeå IK. She is also a member of the Nigeria women's national football team. Leena Puranen is a Finnish football forward who plays for Swedish lower division team Kungsbacka DFF. In 2012 and 2013 she played for Jitex BK in Sweden's Damallsvenskan. She previously played for FC Ilves, United Pietarsaari and HJK in the Naisten Liiga, and KIF Örebro and Hammarby IF in the Swedish league. ↑ Finland - List of Women Champions Rec.Sport.Soccer Statistics Foundation. Retrieved 22 July 2014. 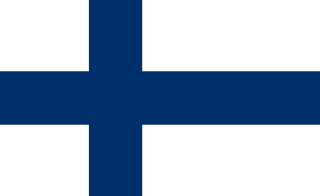 ↑ Finland - List of Women Cup Finals Rec.Sport.Soccer Statistics Foundation. Retrieved 22 July 2014. This article about a Finnish football club is a stub. You can help Wikipedia by expanding it. Turun Palloseura, commonly known as TPS, is a professional football club based in Turku, Finland, that competes in the Veikkausliiga, the top flight of Finnish Football. Nicknamed "Tepsi", the club was founded in 1922. The Amsterdam Tournament was a pre-season association football competition, held in Amsterdam, Netherlands. The competition was hosted by Eredivisie club Ajax at the Amsterdam Arena. It was inaugurated in 1975 as the Amsterdam 700 Tournament to celebrate 700 years of history in the city. It was held annually each summer until 1992, when the last edition of the original tournament was played. It returned in 1999 with the backing of the International Event Partnership (IEP). Four teams participate in the competition, played in a league format since 1986. Douglas Athletic F.C. are a football club from Douglas on the Isle of Man. They compete in the Isle of Man Football League and wear a pink and black kit. They play their home games at Groves Road in Douglas. The Nemzeti Bajnokság is the Hungarian professional league for association football clubs. The league is currently known as the OTP Bank Liga for sponsorship reasons, and it has been the highest level of the professional league since its inception in 1901. UEFA currently ranks the league 36th in Europe. Sport Vereniging Leo Victor, known as SV Leo Victor, is a Surinamese football club which currently plays in the Hoofdklasse. They play their home games in Paramaribo at the Dr. Ir. Franklin Essed Stadion. Etincelles Football Club is an association football club based in Gisenyi, Rwanda. They currently compete in the Rwanda National Football League and play their home games at the 5,000-capacity Umuganda Stadium. Saint Louis Suns United, is a football club based in Victoria, Seychelles. The club was formed as the result of a 2007 merger between Saint-Louis and Sunshine (1993). Prince Louis Football Club is a football club from Bujumbura, Burundi. It is named in honour of the independence hero Prince Louis Rwagasore. Transport United is a football (soccer) club from Thimphu, Bhutan. It was formed in 2000. The club has won five national championships, and was a dominant force in Bhutanese football throughout much of the first decade of the twenty-first century. SC Klinge Seckach is a German women's football club based in Seckach, Baden-Württemberg. The women's club has played eight seasons in the Bundesliga, but at the end of the 1990s their performance fell off and today Klinge Seckach's first team plays in the fifth-tier Verbandsliga. Laura Elina Österberg Kalmari is a Finnish former professional football (soccer) player. Immediately prior to her retirement in early 2012, she had been playing as a forward for American Women's Professional Soccer (WPS) team Sky Blue FC. She is the Finland women's national football team's most capped player and all-time record goalscorer. Druk Pol FC is a football club from Thimphu, Bhutan. Until 1996 it was called Royal Bhutan Police FC. Druk Pol FC plays in the A Division and has won more national championships than any other team in Bhutan. The team plays in the Changlimithang Stadium. Dzongree Football Club is a football club from Thimphu, Bhutan, who currently play in the B-Division of football in Bhutan. 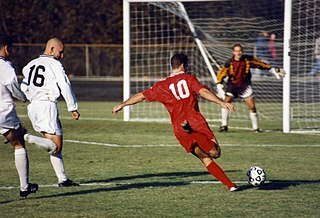 They finished as runner's up in 2003, but have spent most of their history either in mid-table in the A-Division or playing in the B-Division. FC Honka Naiset is a Finnish women's football team representing FC Honka Espoo in the Naisten Liiga. Ferencvárosi Torna Club is a Hungarian professional football club based in Budapest, Hungary.